Venue: Auditorium, KL- Selangor Chinese Assembly Hall, Jalan Maharajalela, Kuala Lumpur. UNJUST is a documentary film made in 2010 about three women’s fight for justice across three Asian nations. Despite the rising economic clout of many countries in the region, state agents still use torture, enforced disappearances and extra-judicial killings with impunity. The women’s personal tragedies drive them on their long and dangerous pursuit of justice; refusing to be silenced by threats to their lives as they become leading human rights defenders in Asia. It relates to justice for Beng Hock to let participants understand the incident better and take action to support the family. Nine years ago, a young man, Teoh Beng Hock was found dead at Malaysian Anti-Corruption Commission’s (MACC) Selangor headquarter when he was assisting in an investigation of alleged abuse of power by his employer, Selangor State Exco Ean Yong Hian Wah involving a sum of RM2400. Nineyears have passed, MACC still fail to prove the case and on the other hand, MACC has been confirmed by Royal Commission and Commission of Inquiry to have caused the death of Teoh Beng Hock. The Prime Minister Najib Razak, who took office since April 2009 until May 2018, vowed to take back the opposition-led Selangor state government at all cost. The unusual aggressiveness of MACC in investigating Ean Yong and other opposition state assemblymen would not be made possible without the green light from Putrajaya. Therefore, the Najib-led government must be held responsible for the death of Teoh Beng Hock. Today, the newly oppointed Pakatan harapan Finance Minister YB Lim Guan Eng has announced that Beng Hock’s case will re-open. Teoh (at that time) was just a witness of the unsubstantiated allegation involving only RM2400 was forced to undergo lengthy interrogation till midnight and was denied of right to legal representation and right to food. 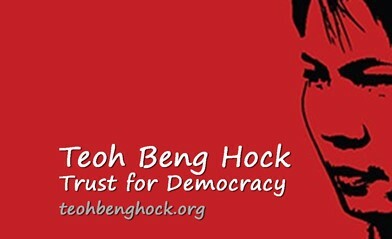 Teoh Beng Hock Trust for Democracy, a memorial trust fund was set up in 2014 to support the justice for Beng Hock cause. Furthermore, the trust is also lending support to other death in custody cases. The organization has been organizing memorial events in the past 8 years and will continue to organize annual memorial events to expose the injustice and violations of human rights. We must always remind the public that Teoh Beng Hock’s family are still awaiting the truth to come to light.